Five chapters, each one narrated by a member of Scott’s expedition and each one sharing their experiences of a different stage of the fatal race to the South Pole. Each stage spans the narrator’s birthday. 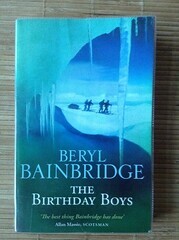 I’ve read drier accounts of the Terra Nova Expedition of 1910–1913, and the deaths of “Taff” Evans, Oates, Bowers, Scott and Wilson, but Beryl Bainbridge’s short novel really brings these five very different men to life.